Actually, it would be quite inaccurate for me to call this a pilgrimage. My partner and I were on our way to Cradle Mountain and driving by Chudleigh when I noticed a strange building. Without a doubt, it was designed to catch one’s attention. It was the Melita Honey Farm. 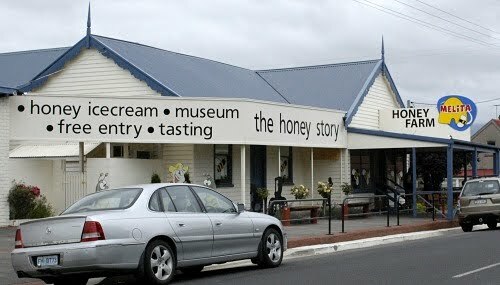 The word ‘honey’ was enough to make me walk through those doors and when I did so I thought I found paradise. Pure stacks of honey jars on the shelves, assembled as neatly as bees would construct their cells. (Pardon the bad analogy). Fortunately I did not have to buy a small tub of everything just to try. A wide selection of their honey produce was also laid out on a table in open jars for sampling. It was absolutely hedonistic. Other than books and petrol, few things inspire a budget conscious botanist to whip out his wallet. I was not leaving the honey farm empty-handed. I got myself two small jars of honey, a bottle of non-alcoholic honey mead and a bottle of apple cider vinegar with honey. Honey was not the only produce. There were beeswax products, propolis, nougats, royal jelly and more. 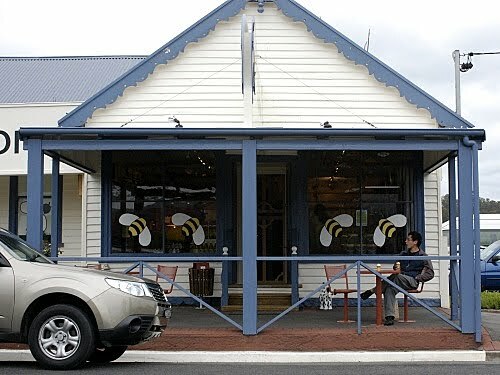 The shop itself was also partly a museum for a self guide tour, in which they featured documentaries of how their honey was made and even displayed a section of hive with live bees. Perhaps what tickled my nerves the most was to see an ice cream bar in the shop selling honey ice cream! My partner and I got a leatherwood and Blue Gum ice cream respectively. The ice cream tasted like any good ice cream would but I suspect that it was dousing the curiosity it inspired that contributed the largest part to the satisfaction. The honey pilgrimage to Chudleigh. Make it at least once in a lifetime! 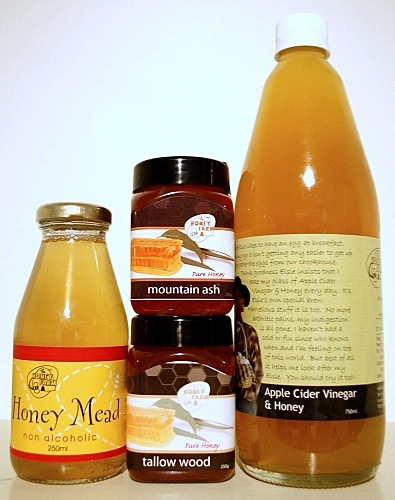 This entry was posted in Botanical Heritage, Honey and tagged Chudleigh, Honey, honey ice cream, Melita honey farm. Bookmark the permalink.